Location: BJ's Restaurant and Brewhouse. There is plenty of free parking at the Conference Center. 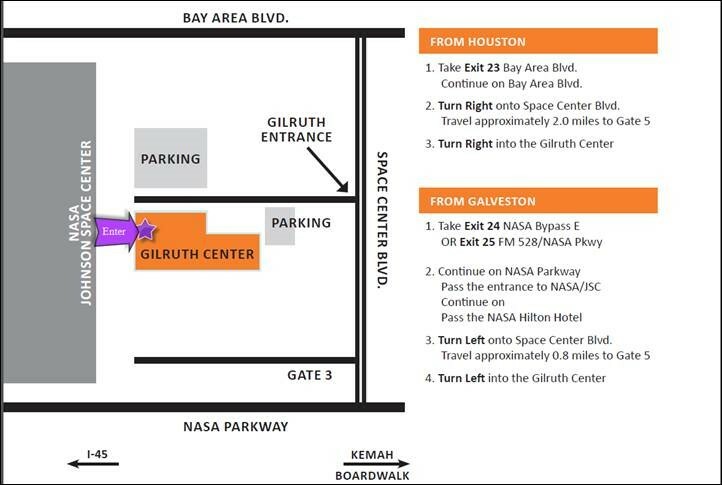 There is plenty of free parking adjacent to the Gilruth Center. When first arriving, you will see a glass door entrance on the left that is for the fitness center. If you continue all the way to the end of the building you will see another entrance. You are able to pull up to the door and unload. It is a one way driveway that opens into the lobby near the Alamo Ballroom. After unloading you can park anywhere.